A simple sentence if syntactically correct if it fulfills given rules. The following are given rules. 2. Then lowercase character follows. 3. There must be spaces between words. 4. Then the sentence must end with a full stop(.) after a word. 5. Two continuous spaces are not allowed. 6. Two continuous upper case characters are not allowed. 7. However the sentence can end after an upper case character. "I love Geeksquiz and Geeksforgeeks." "GeeksQuiz. is a quiz site." "  You are my friend." Question: Given a sentence, validate the given sentence for above given rules. The idea is to use an automata for the given set of rules. …..1.a) Check if the first character is uppercase or not in the sentence. …..1.b) Check if the last character is a full stop or not. 2. 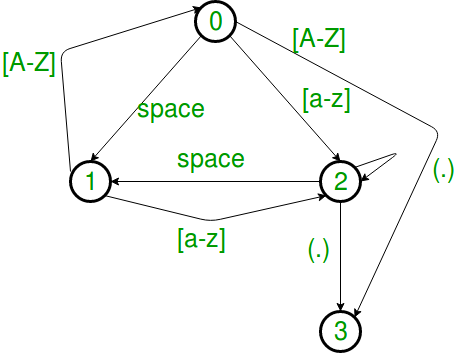 For rest of the string, this problem could be solved by following a state diagram. Please refer to the below state diagram for that. 3. We need to maintain previous and current state of different characters in the string. Based on that we can always validate the sentence of every character traversed. // Calculate the length of the string. // Check that the first character lies in [A-Z]. // 0 = start state. //Keep the index to the next character in the string. //Loop to go over the string. // string and the rule defined in the description. // If current character is [A-Z]. Set current state as 0. // If current character is a space. Set current state as 1. // If current character is [a-z]. Set current state as 2. // If current state is a dot(.). Set current state as 3. // rules in the description of the problem. # Calculate the length of the string. # Check that the first character lies in [A-Z]. # need to check further. # 0 = start state. # Keep the index to the next character in the string. # Loop to go over the string. # string and the rule defined in the description. # If current character is [A-Z]. Set current state as 0. # If current character is a space. Set current state as 1. # If current character is a space. Set current state as 2. # If current character is a space. Set current state as 3. # rules in the description of the problem. # to the next character. print "\"" + string[i] + "\" is correct"
print "\"" + string[i] + "\" is incorrect"
Time complexity – O(n), worst case as we have to traverse the full sentence where n is the length of the sentence. This article is contributed by Kumar Gautam. Please write comments if you find anything incorrect, or you want to share more information about the topic discussed above.